Tall, dark, and handsome, this is truly a prince in the world of Bouviers! We love this guy who is as full of fun as he is good looks! He is princely in his appearance, well-mannered, always ready for a romp, and just great to be around! Prince has fathered some of our best puppies so far! We adopted him as we searched for just the right colors, size, temperament, and background, and he has not let us down! 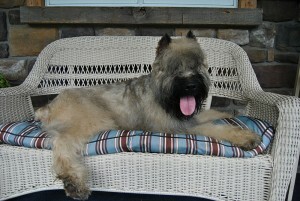 At 26″ tall, he is our tallest Bouvier, and he weighs 90-95 pounds. He is AKC registered and has passed his OFA tests very well. His color is fawn with a darker face and mane, and his coat is soft and thick. He has a happy disposition and is friendly, tolerant, and easy-going. Princess is a beautiful and delightful AKC-registered Bouvier that has been part of our family since the day she was born. 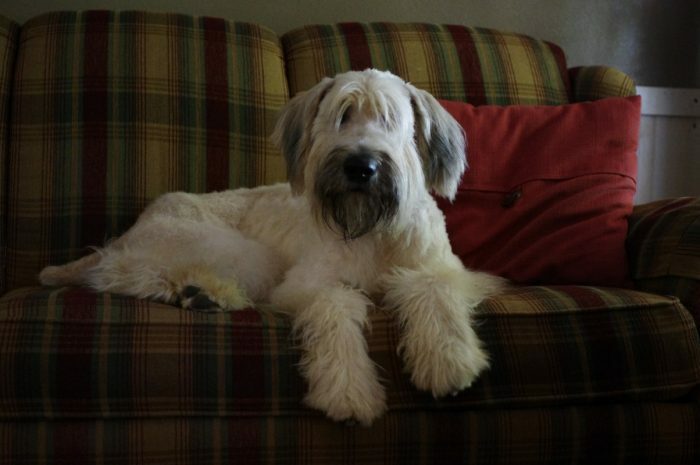 She has everything we look for in the breed–correct form, size and height, health, personality and disposition. She is 26 inches in height, and weighs around 90 pounds. Her color is a creamy shade of fawn. She is sweet, calm, and loyal. She loves everyone but is very loyal to her favorite few! Prince and Princess have made a great team and their puppies are turning out to be as wonderful and gorgeous as their parents are!